These easy examples of container gardens can be a fun and quick way to introduce a beginner to vegetable gardening! 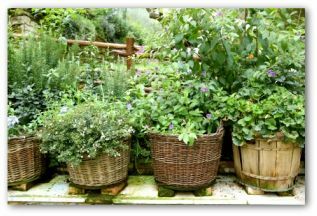 Container gardening offers benefits for every gardener, from beginners, to retirees, and those with limited space for a garden. This is about the only option that many city dwellers have for vegetable gardening enjoyment! It is a method that also appeals to people in the suburbs who may lack usable space other than a patio, balcony or terrace. Container gardens are a convenient gardening method for country homes with lots of sunny porch or deck area. To forgo sowing seed and mixing potting soil, you can purchase a variety of vegetable plants to begin your container garden. 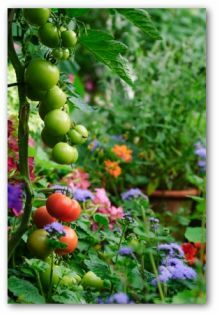 • A good start is tomato, cabbage, eggplant, and pepper plants. 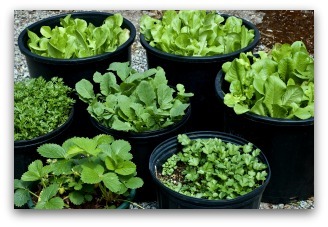 • You can also add seedlings of lettuce, broccoli, celery, cucumbers, and herbs, all ready to go into containers. • Transplants are available at garden centers in neat trays, flats, or individual pots. 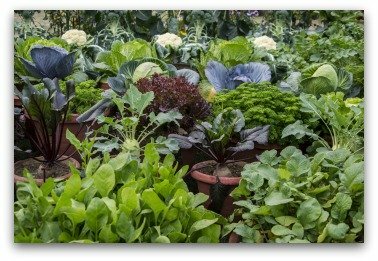 • If you have the room for a good-sized planter, you can grow a miniature vegetable garden. • Place it in the sunniest spot available. • Such a box can support all the ingredients you need for garden salads. • For example: lettuce, onions, cherry tomatoes, chives, basil, and chervil. 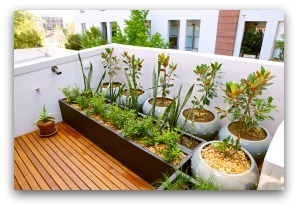 • Ready-made window boxes can be purchased in various sizes for rooftop, balcony, or terrace container gardens. A garden trough is one of the most popular containers for small-scale container or potted gardens. Troughs come in materials such as limestone, sandstone, concrete, or granite. 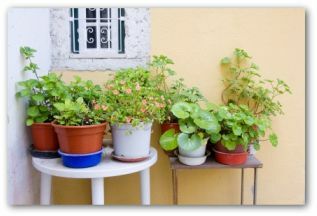 Clay and ceramic pots are durable and attractive garden containers. Empty this type of containers before freezing weather to prevent damage or breakage. Wood containers are lighter and less expensive than clay or ceramic. Line wooden containers with plastic to prolong life of the container. An oak half-barrel makes a perfect potted garden container. Plastic containers are inexpensive, and can provide a sturdy and colorful home for container garden plants. Early examples of container gardens would be the Hanging Gardens of Babylon. The garden was a gift for Nebuchadnezzar's wife and is listed as one of the seven wonders of the ancient world. The amazing garden was supported on stone columns. Archways were located on cube-like foundations. You climbed via a staircase to get to the highest terrace-roofs. Plants and trees were cultivated in the upper terrace rather than in the ground. Water flowed down sloping channels from elevated sources and irrigated the entire landscape. Millions of people in the United States, Canada, and Great Britain played a significant role in the Allied victory of WWII simply by growing their own produce in what became known as "Victory Gardens". Roughly 20 million Americans produced up to 40 percent of all the vegetables consumed nationwide in the last years of the war. In doing so, home gardeners saved the country tens of millions of dollars. The gardens were planted not only in rural and suburban backyards but also on rooftop city apartment blocks and public areas. 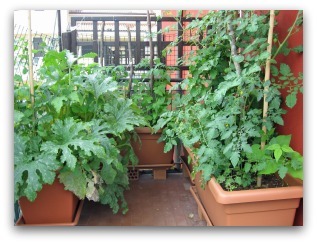 Other examples of container gardens are hydroponic gardens. With this gardening method, in place of soil, plants are grown in water that is loaded with essential nutrients. 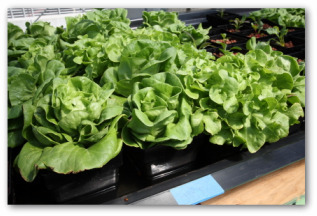 Examples of vegetables that are successfully grown using the technique are: lettuce, cabbage, peas, and tomatoes. Indoor and outdoor units that contain the plants and mineral solution are typically made of fiberglass with brass fittings. Container gardens require little work, especially if you start with sterilized, weed-free soil. After filling a new container with soil, water it thoroughly, and let the soil settle for a few days before planting. Flowers, herbs, and vegetables make ideal garden companions in a container garden. 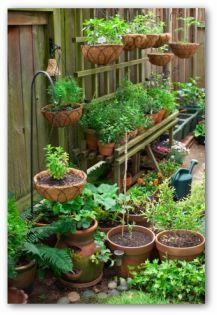 In addition to giving you greater control over care and maintenance, container gardens offer another advantage. The smaller scale of this type of vegetable gardening means more attention can be paid to your plants.